Eclipse's are science phenomenon, this animation explains Eclipse, based on geometrical distances, diameter, alignment, radius and palne of revolution of Earth, Sun and Moon, all the cases are taken and explained through in-depth animation. This 100% animated topic is very useful for educating school students, astronomy enthusiast and teachers of Geography. 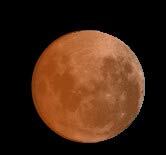 What are the conditions necessary for solar and lunar eclipse to occur ? Why total solar eclipse is rare? Why does the moon becomes various hues of red in total lunar eclipse ? What are bailey beads? Corona ? How can the tiny moon obscure the gigantic sun ? A lunar eclipse happens when the Earth moves between the Sun and the moon, blocking part of the Sun's light from reaching the moon. 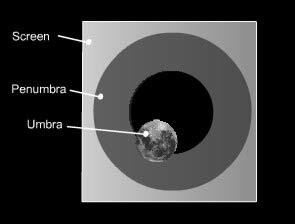 During a lunar eclipse, Earth's shadow lies on the moon partly or completely obscuring it resulting into partial or total Lunar eclipse. Event is very subtle and quite difficult to observe. It can be easily , even with the unaided eye. This is quite striking for the vibrant range of colors the Moon can take on during the total phase. In a solar eclipse, the moon moves between the Earth and the Sun. When this happens, part of the Sun's light is blocked. The skybecomes darker as the moon starts moving in front of the Sun. When the moon and Sun are in a perfect line, it is called a total eclipse. Total solar eclipses are very rare seen only once in person's lifetime. There are partial , total and annular solar eclipses also . In an annular solar eclipse the Moon disc is not completely able to cover the Sun's disc thereby leaving radial regions through which the light comes through. To see a total solar eclipse, one has to be on the the right spot on the earth. Total solar eclipses occur because appearance wise Sun and Moon both look the same size in the sky. (one-half degree in diameter). Actually they're not really the same size. The sun's diameter is nearly 400 times the moon's diameter. However the sun is also 400 times further away from the earth,hence its diameter apparently looks the same as the moon's. The "path of totality" is never more than 167 miles in diameter, and is usually less. This means that very few people have seen a total eclipse as the shadow only covers a very small area on the earth. 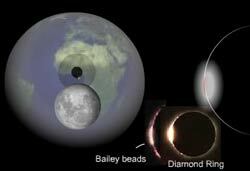 For Total Solar eclipse to occur New moon is necessary . This phase of the Moon occurs when the Sun is almost directly behind the Moon, and we see only a sliver of the Sun's light reflected by the Moon. During this time the Moon and the Sun appear close together. The second event that must occur is that the Moon must be in the right position, directly in the line of sight between the Earth and the Sun. Ans: One of the basic properties of light is that light rays always travel in a straight-line path. This property of light is called the rectilinear propagation of light. Shadows are direct consequence of rectilinear propagation of light and are formed when an object is placed in the path of light. Two parts of a shadow are umbra and penumbra. More of this in basic properties of light animation on our site. Ans: Glad, you asked. Should an educational site always be serious and sober in looks? Our animations are bright and vivid but not peppy and so is the site. If you look at the site it is more in pastel shades, it is the images of the animation that impart colour, replace them by sombre ones, the whole mood will change, it will look uninviting like a text book in black and white as compared to that with colour. But we respect feedbacks, and will take a hard look at our site. Suggestions are welcome.